“Dust Duct” is a total system of pre-engineered, welded metal ducting and fittings for dust control work. There are more than 25 different types of fittings in a full range of sizes from 2″ to 36″ diameter – by half-inch increments. 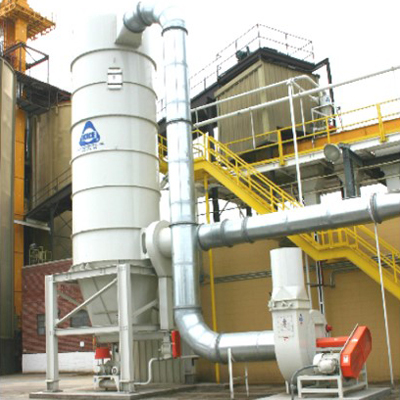 These types and sizes cover almost 100% of the requirements for air pollution and dust control systems, excepting very unusual or extremely large jobs. Most Dust Duct is constructed of 16 gauge mild steel (through 17” OD size), joined together by CC couplings. Large size fittings (18” OD and larger) are 14 gauge and fittings under 8” OD diameter are typically called out as Kice Speed Spout fittings when applicable. Larger size fittings are connected with flanges (See Table 1). Standard finish for steel Dust Duct is a finish coat of Kice white paint. Some fittings 8” OD and below called out as Speed Spout items may not be painted as standard. Other materials such as aluminum and stainless steel are available. Dust Duct fittings such as transitions and tapers are made with short straight end collars to permit joining by standard compression couplings or flanges. Collar lengths are 4”, 5″ or 6″ depending on diameter as shown in Table 1. Flanged straight pipe and ells are normally supplied with one flange welded to one end, and the other flange loose so it can be welded in the field so bolt holes can be aligned to fit as required. Other fittings may have all flanges welded on. Note that longitudinal seams are normally centered top or bottom. Flanges are welded to the part so one bolt hole is in line with the seam. Fittings are made with collars, even when flanged. The part number code is the key to the system. It is a convenient form of short – hand not only for catalog purposes, but is also useful for the system designer, purchasing, billing warehousing, invoicing, etc. It greatly simplifies system layout. A single line diagram, with components specified by Dust Duct part numbers, can tell as much as detailed drawings and can be drawn in a small fraction of the time. See Figure 2. A Dust Duct part number consists of a prefix with one or more pairs of dash numbers. The prefix includes two letters and two digits. The two letters indicate the fitting type and the two digits indicate its main dimension “A” (usually diameter) in inches – and halves where applicable. This is followed by one or more pairs of numbers (separated by dashes) indicating other dimensions – B, C or D, corresponding with drawings in the catalog. A single digit dimension (less than 10″) should be written with a zero ahead of it, thus -07. Typically a section of straight pipe 12″ diameter and 120″ long would be part number SS12-120. The letters “SS” indicate Section, Straight. The number “12″ indicates dimension “A” (tubing diameter) is 12 inches. The dash tells us there is no fraction. The “120” following the dash indicates the pipe length “B” (per catalog drawing) to be 120 inches. SS12½-60 would be 12½” diameter and 60” overall length. More complex parts that require more dimensions in order to specify essential items have more digits in the part number. Such dimensions are indicated in the catalog drawing by letters. The part number dimensions correspond to the letters in alphabetical order. It is necessary to refer to the catalog drawing to be sure you properly relate each code letter with its dimension. The drawings show certain common dimensions, angles and ratios. Unless otherwise specified, collars will be the standard dimensions, per Table 1, likewise flanges per Tables 2 and 3. If non-standard collars and/or flanges are required, full information should be furnished with order, preferably by sketch. Custom-design fittings are available.